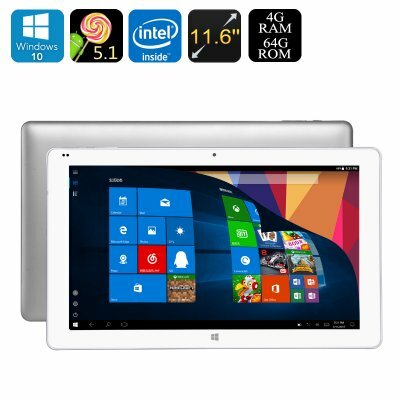 Successfully Added Cube iWork 1X Tablet PC - 11.6 Inch IPS Touchscreen, Windows 10, Android 5.1, Intel Atom Z8350 CPU, 4GB RAM to your Shopping Cart. Licensed Windows 10 and Android 5.1 operating systems bring the best of both worlds. The Cube iWork 1X is an extraordinary tablet PC that is powered by an Intel Cherry Trail Z8350 quad-core CPU and 4GB of RAM. With the newer Intel Atom X5 processor that can reach speeds of 1.92GHz, this tablet PC is able to handle the most complex tasks with an ultra smooth performance. When using for simpler tasks the CPU will help save you more battery life by running at 1.44GHz. This 2 in 1 Tablet PC will be suitable for both office work, gaming, and social media with its Windows 10 and Android 5.1 operating systems. It boasts a magnetic suction Interface letting you can connect this tablet PC to a wireless keyboard, (not included) that makes the versatile Cube iWork 1X your compact tablet PC or a portable laptop. A large 11.6 inch IPS touch screen brings a great canvas for working and viewing. With 1920x1080 resolutions you can enjoy rich color depth and details. Thanks to the screen's low light reflection, wide viewing angles, and a brilliant brightness it offers immersive graphics for games and movies that can be shared with others on a larger screen using the mini HDMI port. Built in speakers on the left and right side of the tablet PC ensure quality authentic audio without distortions and the hi-fi speaker system delivers great music and sound that will surround you with its brilliance. When it comes to storage you will have plenty of options as the 64GB of onboard memory can easily be complemented via the micro SD card slot which can bring an extra 128GB of space. Added to that the OTG functions and USB ports and you'll be able to add memory pens and a host of other peripherals such as game controllers. The 8500mAh battery housed in this Tablet PC delivers as much as 6 hours of usage time so you can enjoy plenty of entertainment or hours of work without needing to recharge. Cube iWork 1X hybrid tablet PC comes with 12 months warranty, brought to you by the leader in electronic devices as well as wholesale Tablet PCs and hybrid laptops..
As a wholesaler, we provide no software support, advice, or training regarding the operating system and software. Any attempts to modify the default OS will void the warranty.